….I note that not only does Kinsley’s column explicitly discuss the lack of evidence for Kinsley’s thesis, but it also details the theoretical error Kinsley is making—thinking too moralistically about the economy. He says “on economic matters, I’m a puritan.”….In his view, a greater punishment must be over the horizon for the sake of the moral order. And since recession is, by his lights, not enough the only other economic calamity on the menu is inflation. And so, he deduces, we must be heading for inflation, even though he himself recognizes the reasoning as so specious that he won’t use it as the basis for investment decisions. I’m going to defend Kinsley a bit. One reason is that although he freely talks about the inner demons that prompted his heresy, he does, in fact, also offer up a concrete reason for his fears: “My specific concern is nothing original: it’s just the national debt….We talk now of trillions, not yesterday’s hundreds of billions.” This is not a completely nonsensical concern, even if it would be better expressed as a percent of GDP rather than in raw dollars. What’s more, if Kinsley had wanted to write something a little more sophisticated, he could have spent some time on the Fed’s likely problems unwinding its trillion dollar balance sheet over the coming years, something that has at least the potential for sparking inflationary pressures if it isn’t timed pretty delicately. But that’s not the real reason for defending Kinsley. The real reason is this: I sort of agree with him. Is it because we were both around for the 70s and remember what happened then? Maybe, though Paul Krugman and Brad DeLong were around then too and they’re not worried. And intellectually, like Kinsley, I agree with them: inflation just doesn’t seem like a big issue right now. But what about a few years from now? It really does look as if our political system is going to find it next to impossible to control our long-term federal deficit, and at the same time the dollar is going to have to come down in value eventually. 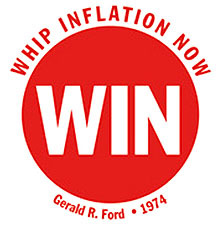 Both of these things, along with the Fed’s operations, pose inflationary potential. And I have a fairly healthy respect for the proposition that if the Fed loses its reputation as an inflationary hawk, it’s much harder to get back than you might think. So here’s the question: if all the people you respect say that inflation isn’t a big issue; if all the market evidence points toward moderate inflationary expectations; and if your fears of inflation are almost certainly grounded in demons from your youth — if all that’s true, but you still feel the fear anyway, what should you do? Nothing? Or should you write about it, being honest along the way about what’s driving you? I’d vote for writing about it, for one simple reason: if smart people are still worried about this even though the experts say there’s nothing to worry about, the experts need to do a better job of telling us why we’re nuts. Brad DeLong, I invite you to write a Kevin Drum Smackdown Watch about long-term inflationary fears. Pretend you’re writing a response to a respected liberal economist, since that’s more likely to produce a serious scholarly survey. Tell me why I’m crazy.